← "The Rains of Castamere"
Plot. Income: 4. Initiative: 4. Claim: 1. Reserve: 6. Plot deck limit: 2. Reaction: After the challenges phase begins, gain 3 gold. 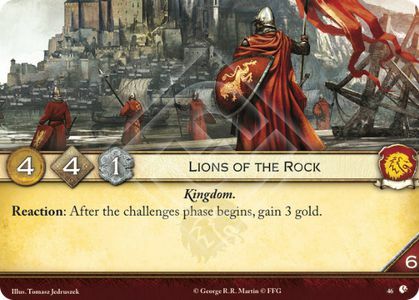 Lions of Casterly Rock #46.